When a whale breaches, it can be awe-inspiring. The giant, bus-size creature peeks out of the sea, white foam and salt water spilling around it like lava, before the sea pulls it back in, crashing like thunder. The first time Haley Lasco ’19 saw a humpback whale breach it didn’t happen just once but upwards of 20 times. 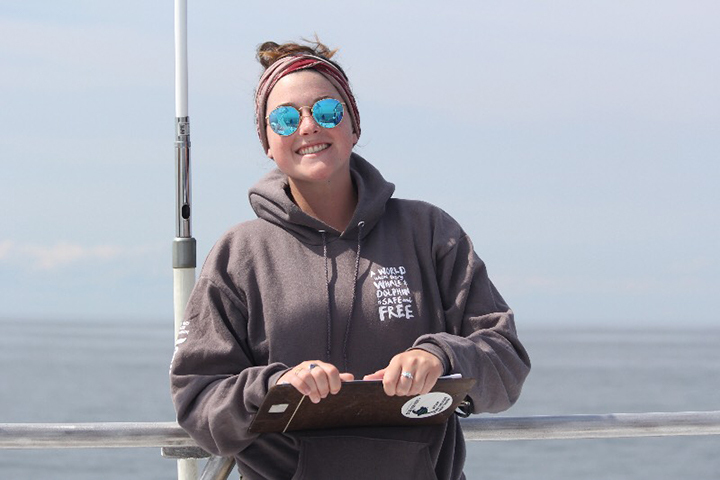 Haley Lasco ’19 is interning this summer for Whale and Dolphin Conservation (WDC), a nonprofit organization that works for the protection of whales and dolphins. She has spent her summer in Plymouth, MA, interning for Whale and Dolphin Conservation (WDC), a nonprofit organization that works for the protection of whales and dolphins. Out of the six days a week she is working, three are spent on whale watching boats. Part of her job involves data collection on whale watching boats. In this photo, she is the one in khaki pants with the camera in her hands. Single use plastics include everyday items like water bottles, coffee stirrers and most food packaging. This summer, UT’s Dining Services announced it was discontinuing the use of plastic straws (though still available for those in the disability community), joining a movement of other restaurants across the nation, like Starbucks, that announced this commitment to reducing non-biodegradable plastic waste in the environment. Lasco is president of the UT Scuba and Snorkel Club, which has worked to reduce waste in Tampa Bay with cleanups of Gasparilla beads in Seddon Channel following the annual boat invasion and parade. 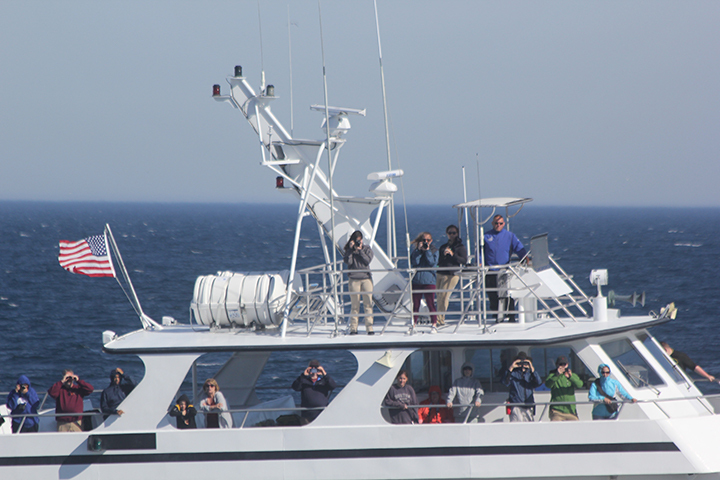 The data Lasco and the team collects while out on the whale watching boats is processed into WDC’s database and used to track the number of whales injured by human causes, like net entanglements and boat strikes, as well as the number of healthy whales. In addition to this data collection, Lasco participates in community outreach events educating the public on safe boating practices in regard to whales. When she graduates, Lasco, who is a marine science–biology major, would like a job working on either rescue and rehab or necropsy with large marine animals and then eventually go to graduate school.